Home Gardening 101: 3 Plants to Start Your Summer Garden That You Can’t Kill (Promise) | Yellow Co.
My garden had humble beginnings. Very humble. I bought a premade veggie garden in a pot from a garden center that had six things in it. I immediately killed one of them and the others all produced very, very tiny fruit. It was still so rewarding and pushed me to learn more about how to make my veggies happy and healthy. Since that fateful summer, I now have two raised beds in my little suburban cul-de-sac. I was determined to find a way to explore my dream of wanting a big garden and one day thought, why not just go for it? Actually, it didn’t exactly start that way. My husband challenged me and told me that, “This gardening dream was just a phase.” So I set out to prove him wrong. That I did, friend, that I did! I also wanted to find a way to pursue this little passion and see if it was real. Turns out, watching things grow and then being able to feed my family with them is something I never tire of and that inspires me to seek out everyday wonder. If you’re just starting out and have that itch to get your hands dirty and see something grow that you can pick and put straight on your plate, here are three plants you can’t kill (that can all grow together in one pot! ), and three rules of a green thumb. Wherever gets the most sun possible is where you want to place your plants. Anything you plant in Spring will be giving you goodies in Summer and those plants need all the sun. Water daily. Most plants in Spring need water just about every day or every other day. See if the top of the soil is damp, if so, you’re good. If not, water. I tend to water potted veggies until I see the water run through the bottom. You don’t need fancy soil. Just get some organic potting soil (if planting in a pot) and some basic veggie fertilizer to give to your plants when you plant them, when they start to bloom, and when they start to show fruit. Three no-kill plants: These three plants can all be planted next to each other, all work together in one dish, and are all easy to keep alive! Try planting them in a big 10 inch to 12 inch pot if you want to keep them all together to minimize your watering efforts. This herb is one that is so easy to grow and use over and over. Chives are similar to green onions and closely related to garlic. It’s such a great final touch to many dishes, and will be very happy growing alongside tomatoes and basil. These guys are actually pretty durable. Just read the leaves. If they look droopy, more water. With a lot of sun and water almost daily, you should see some fruit fast. Plus, nothing tastes better than a homegrown, sun-ripened tomato (many veggies and fruits like tomatoes are actually ripened at the grocery store, and lose a lot of flavor). Basil is another herb that is so useful, tasty, and easy. They need consistent sun and water, and you can tell if they’re needing attention, because they’ll droop (like your tomatoes). You can harvest this over and over again as well, and it smells wonderful! We’ve ALL killed plants, but gardening doesn’t have to be scary or hard. They key is to just look at your veggies daily, see if the soil is wet (these plants all like a little moisture on the very top of the soil), and keep them well-lit in the summer sun. 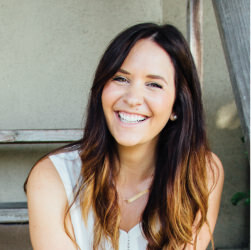 Bailey is a writer, wife, and mother, as well as the Director of Generosity and Culture for Auric Road, a petite resort hospitality brand, where she creates unforgettable experiences for guests and the community. She brings a wealth of knowledge from over ten years of studying the way the private sector interacts with the social sector, and how cause marketing can change the world. She founded her own social responsibility firm, Abel Impact, and has worked with companies like Google, Sysco, MasterCard, Club Corp, and many others. Bailey’s ultimate passion lies in writing about home and happiness, along with her love for her family, yoga, cooking, and doing anything outside.